Gentle readers. Thank you so much for stopping by. I have been writing about plays and books for decades but, until this moment, only for academic journals which, for the most part, have provided me with no feedback. Now, dear readers, I have you, and I thank you in advance for letting me know what you think: my email address is at the foot of this piece. I’m conscious of following in the footsteps of the wonderful Molly Tinsley who has written with such distinction in this journal and its predecessor. And so, with no little trepidation, I plunge into my task. Two very different productions in the Angus Bowmer Theatre opened the 2017 OSF season in February. One was a play by Shakespeare, the other a play about Shakespeare: in their different ways, they were both splendid, not least because each drew upon the depth of talent available to this outstanding company. 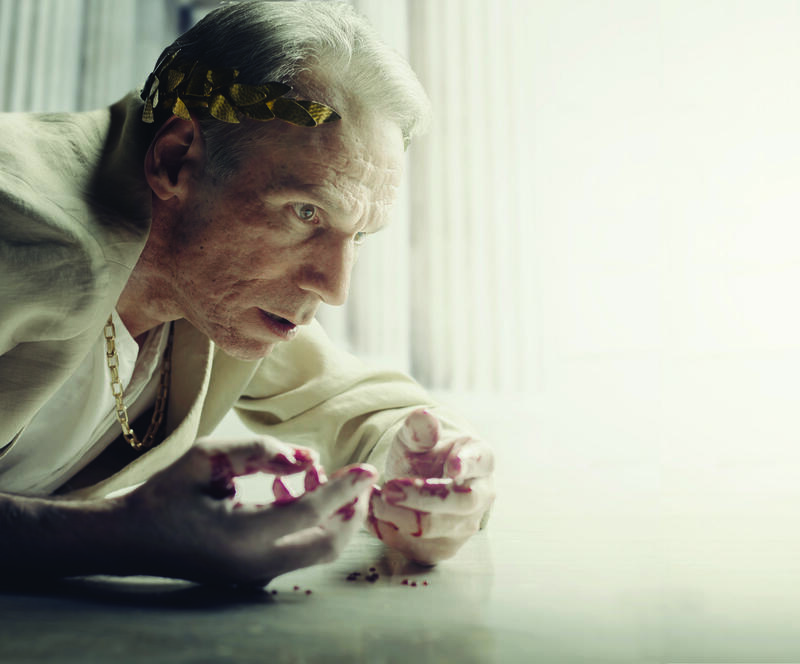 I felt confident in advance that I was going to be impressed by Julius Caesar, because the cast included so many actors whose work I have enjoyed before. Any production involving Armando Durán (Caesar), Danforth Comins (Brutus) and Kate Hurster (Portia) cannot fail to be successful: they are consummate performers who speak Shakespeare’s words clearly and with intelligence. Jordan Barbour is less familiar, but his Antony was a triumph, and one could only wish that his character had more lines. 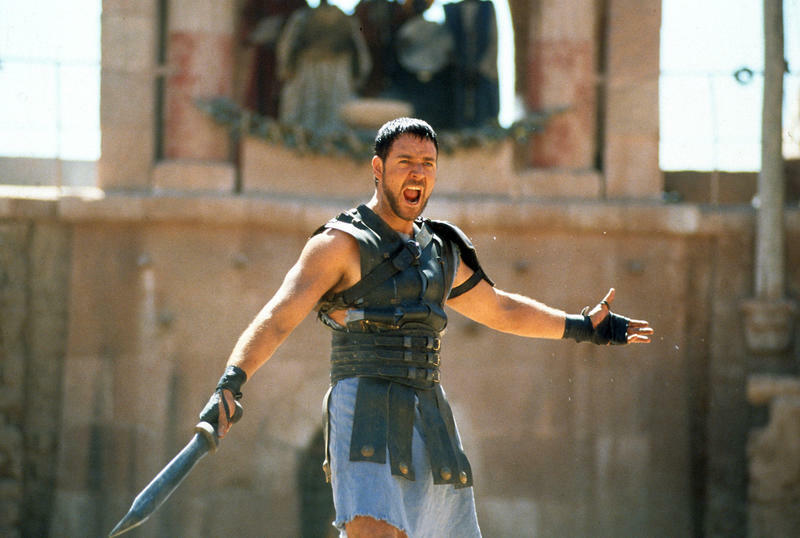 The surprise for me among the principals was Rodney Gardiner as Cassius. His previous Shakespeare roles have been largely distinguished by his physicality and comic timing, but this Cassius demonstrated that he is more than capable in a serious role, and this performance will get better as the season goes on: I look forward to seeing him as Iago one day (perhaps one day soon?!). But this was a company production and I cannot praise the director enough for inspiring these actors to work with such commitment, especially in the second half which was, at times, simply breathtaking. After graphic and bloody presentations of the deaths of Caesar and of Cinna the poet in the first half of the play, Shana Cooper made the bold decision to show us fully realised battle-scenes. These are often represented only in a sketchy or token fashion, but this cast fought: facing the audience, they stamped, grunted, and used emphatic, rhythmic arm gestures — all, in choreography which was beyond superlatives. You may never see a better representation of war on stage. Although the text suggests in its final lines that the fighting is over, in this version the actors continued their dance of war beyond those closing lines and, stood panting, glowing and triumphant when that dance came to an end. 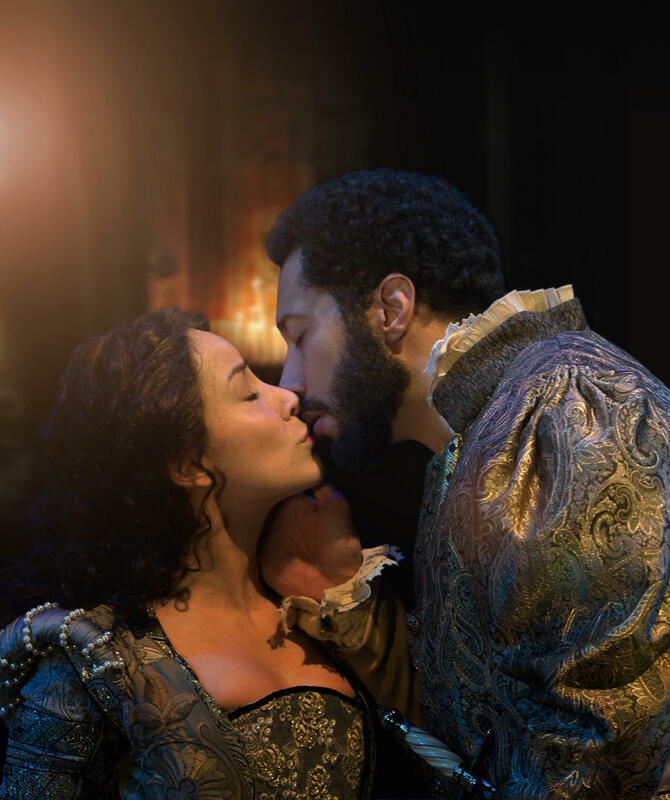 Audiences will probably be familiar with the story of Shakespeare in Love from the award-winning film from 1998 (there was also a song of the same name by Layla Kaylif, probably best forgotten). Jamie Ann Romero (Viola de Lesseps) and William DeMeritt (Will Shakespeare). I saw the stage version when was first produced in London in 2014: a version which had mixed reviews. It was three hours long (significantly longer than the film on which it was based), and did not always sustain the attention of the audience. In truth, that was partly Shakespeare’s fault because Romeo and Juliet take so long to die, and that production preserved almost all of that death scene. More significantly, there were accusations that the casting had been done more on the basis of who most looked like the actors in the film than on the basis of who could actually act. This is the first US production of the stage play: it had its North American premiere as part of the 2016 Stratford Festival in Ontario, although reviewers also found that version too long. How would OSF overcome these potential pitfalls? Firstly, the director, Christopher Liam Moore moved along at pace, with a simple and mobile set rather than one which, like the London production, copied the solidity of an Elizabethan stage. This (and a simpler death scene) cut the running time considerably, and gave the whole production the feel of an Elizabethan version of the backstage farce Noises Off. Secondly, although the actors in the two principal roles (Jamie Ann Romero and William DeMeritt) are not well-known at OSF, the production could rely upon our familiarity with and fondness for a great many of other members of this cast of more than twenty actors and musicians (plus a dog!). Thoughts of the film quickly disappeared from the mind. This was a company of actors thoroughly enjoying themselves. And those two principals were very good indeed! This a most enjoyable theatrical experience: far superior to the London production. The costumes and video projections made this a visual treat (another benefit of keeping the set simple), while the beauty of the words was enhanced by the beauty of the music. I am unsure whether Kate Mulligan’s Elizabeth or Preston Mead’s Webster will win the award for scene stealer of the season: each was delightful. And, although everyone adopted British accents, I did not find that decision to be a problem. Both of these plays are in repertory until October. Historian Mary Beard has spent her career working through the texts and source materials of ancient Rome. She has written several books on the subject — including her most recent work, SPQR: A History of Ancient Rome — but she doesn't feel like she's close to being done with the topic. "One of the great things about history is that it sort of isn't a done deal — ever," Beard tells Fresh Air's Dave Davies. "The historical texts and the historical evidence that you use is always somehow giving you different answers because you're asking it different questions."